Graphic Illustration for the front of the brochure, modification to Safe Streets Project logo. As part of the marketing collateral for the Safe Streets Projects in Brattleboro and Burlington, I again worked with the Outreach and Education Coordinator at Local Motion to design and informational brochure about the Project. Featured above is the brochure that will be used in Burlington, Vermont. The front cover features an illustration combine all three modes of transportation (cyclist, pedestrian, and motorist) in a manner than highlights being friendly and respectful while interacting on the road. The heart echos the intention of the images and strengthens the message of amicable road sharing. 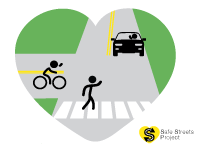 We decided that modifying the logo for the Safe Streets Project to include the heart would create a more consistent public image of the project and reinforce the idea of friendly road sharing.